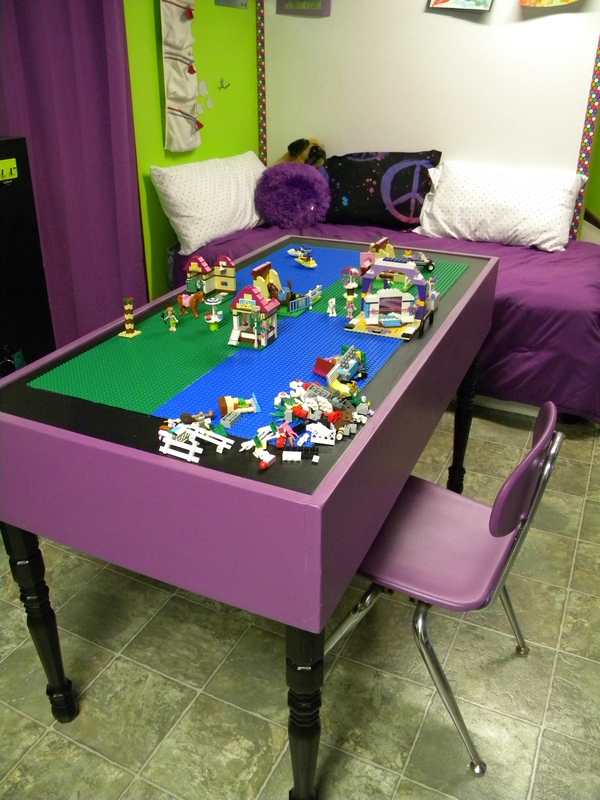 I wanted a reversible Lego and activity table for my children. I looked at new and used tables but could not find any that would work for us. The new tables were too expensive, most were flimsy, too small, too short and lacked storage. So, I designed and built my own table. 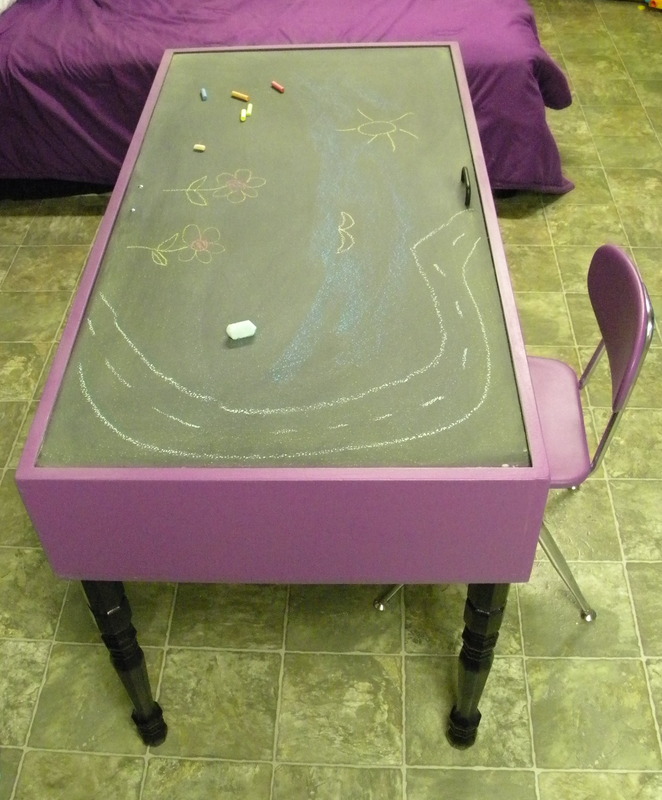 The children love to play on it and I am in love with the storage! 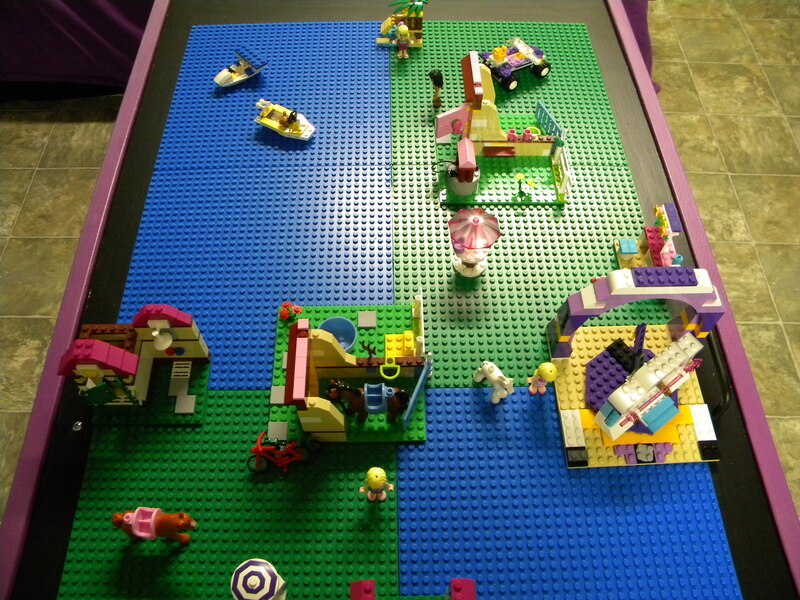 Legos are great for building, fine motor skills, creative play, etc. 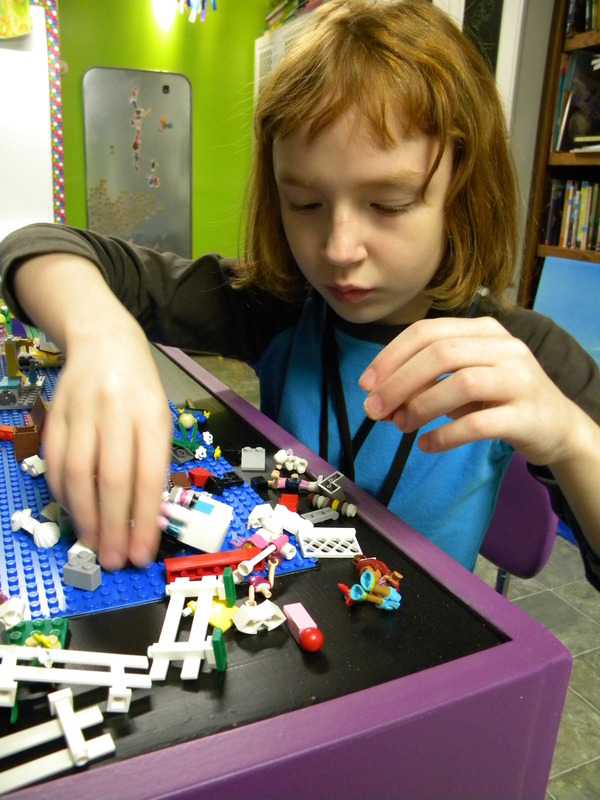 but my kiddos NEVER wanted to put away or take apart ANY of their creations. So, we moved the Legos off the dining room table when it was time to eat, moved them off the couch when we wanted to sit and I basically spent hours (well, it seemed like it) moving Legos around every day. 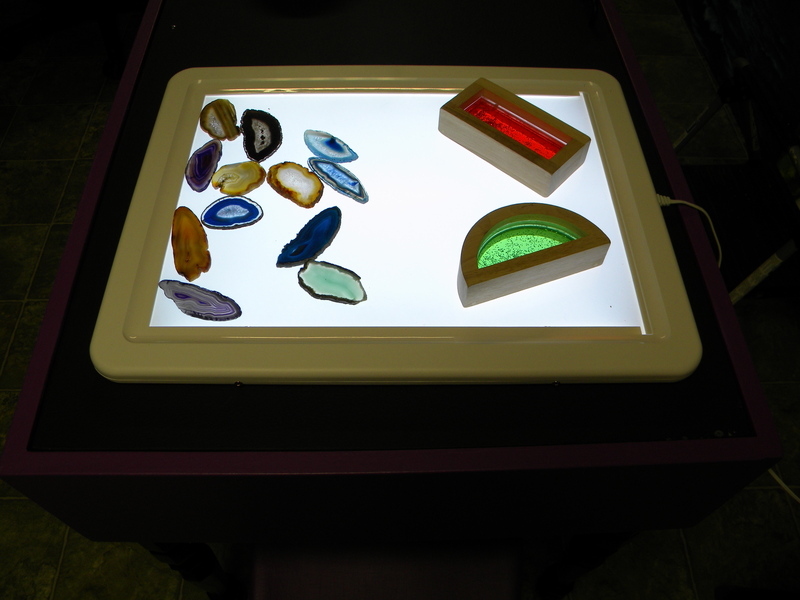 Now we can put the finished creations in the table when it’s time to use the table for something else (light box time, playdo, puzzles, etc.). Also, we never had a good place to keep our light box before. **All joints are made by applying wood glue, pre-drilling countersink holes and then screwing together with wood screws. Use the longest screw possible without going all the way through the second piece of wood. I used screws in three sizes for this project: 3/4″, 1 1/4″ and 2″. i prefer to use screws with square drilling points since they don’t strip as easily as the standard heads. 1. Build a rectangle shaped box with the 2×8’s. For strength, alternate boards so they attach at the end on the right, and on a side on the left (see photo); using a carpenter’s square to check each corner. 2. Cut 3/4″ off of the end of each of four 1×2’s. These will be the furring strips to support the bottom of the storage compartment. Line up each piece so it is flush with the outside of the box. Overlap previous joints (like building with Legos) to increase strength and attach. 3. Now flip the box over so that the furring you just added is on the bottom. 4. Use a jigsaw or handsaw to cut the hardboard so that it fits snugly inside the box (mine is 23 1/4″ x 47 1/4″). *Covering the area to be cut with masking tape prevents chipping of hardboard, plywood, etc.. Attach board to furring strips. Avoid using screws in the four corners if you plan to attach legs later. 5. Cut the 2×2 into four 4.5″ pieces (these will be the supports to line up the upper furring strips and will also provide a place to attach optional legs later). 6. Attach one support in each corner. 7. Cut each of the two remaining four foot 1×2’s into lengths of 47 1/2″. Attach vertically to the inside of the box (one on each side) resting on the supports placed in step 6. Cut the remaining two foot 1×2’s into lengths of 21 3/4″ and attach as shown. 8. Fill all screw holes with wood filler and allow to dry. 9. Check the fit of the plywood top now. It should be large enough so that it overhangs and rests on the furring strips, but there also needs to room to easily lift it up without scraping the sides of the table (Remember that primer, paint and poly will add additional width). I needed to sand down about 1/16″ on one end. Next, mark the center of the table top and drill holes to attach a handle on each long side, about 1″ from the edge (be certain the handle will clear the furring strips when inside of the table). 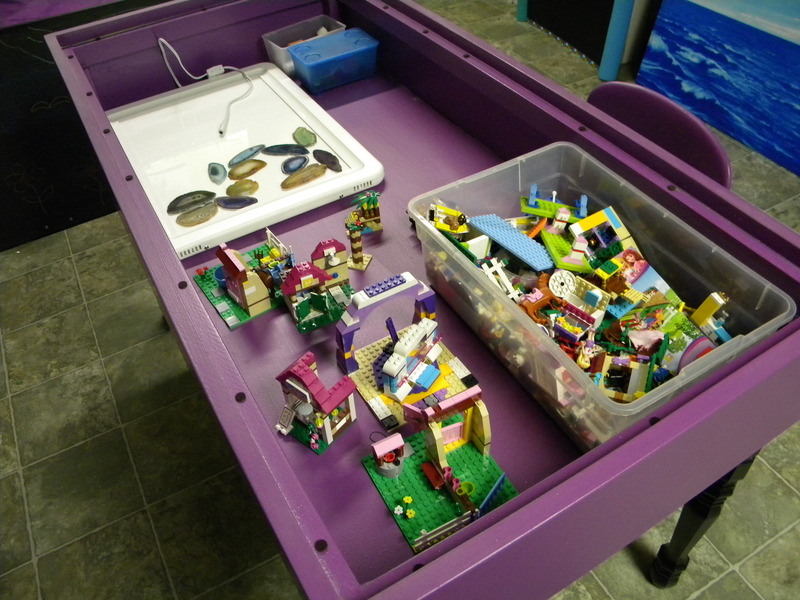 Attach one handle on the side for the Lego plates, flip the top over and attach a handle on the chalkboard side. *Alternately, you could drill finger holes and skip adding handles. 10. Sand the entire piece thoroughly, paying special attention to joints. I also semi-rounded every side of every board (inside, outside and corners) to ensure there would be no sharp edges anywhere. 11. At this point you can add leg hardware if desired. There are too many styles and sizes of legs to list here. I chose to use a plate system (4 plates at $1.56 each). Once the plates are installed you simply screw in the legs of your choice. 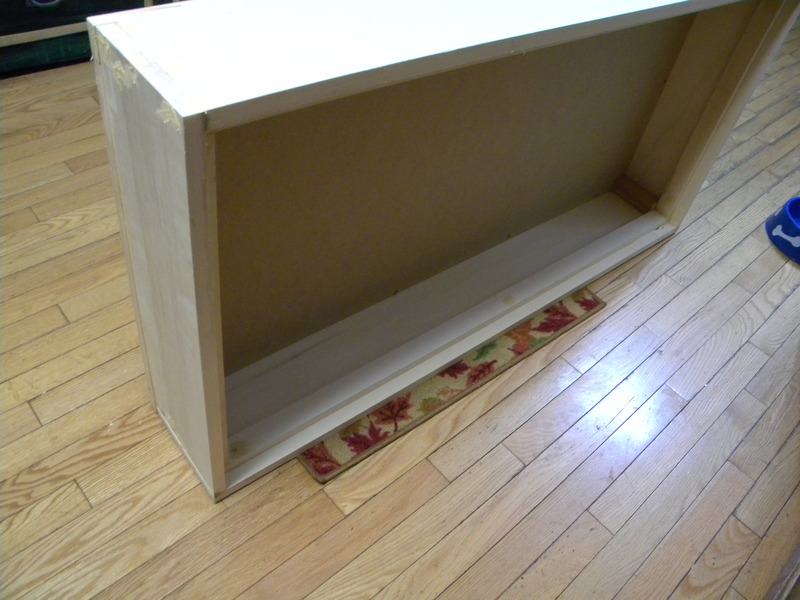 The plates I selected are 2 1/2″ square so I attached an additional 1×2 to the bottom of each end of the table. This provided a 3″ square area to attach the plates. 13. Paint entire piece. 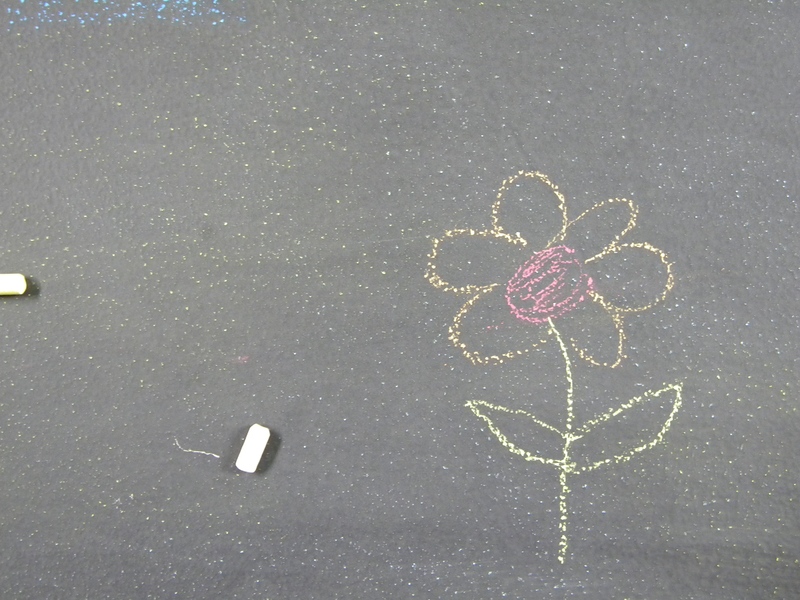 I painted the chalkboard side of the top first since it requires three coats and at least 3 days for curing. I used a scissors to poke four holes on the bottom of a cardboard box and used that to hold the legs in place while drying. 14. Apply 3 coats of polyurethane to the base, allowing each coat to dry and sanding lightly (I use a sanding sponge for this) in between coats. Do not apply poly to the table top at this point. You will not apply poly to the chalkboard side at all, applying poly to any exposed areas on the Lego side should be done after attaching the Lego plates to ensure adhesion. 15. Apply felt bumpers to the top of the furring strips that support the table top. This will prevent scratching. 16. 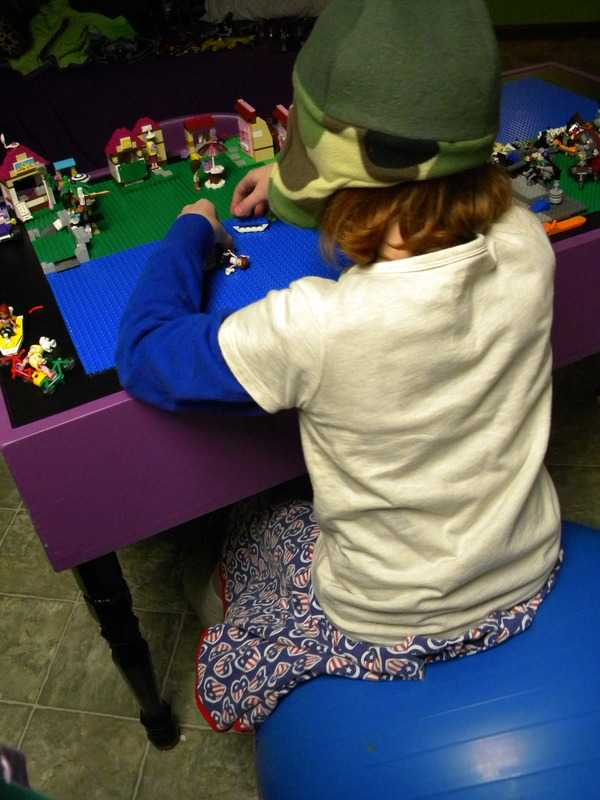 Arrange Lego plates as desired on table top. **Very important: use Lego bricks to connect each plate to the others. 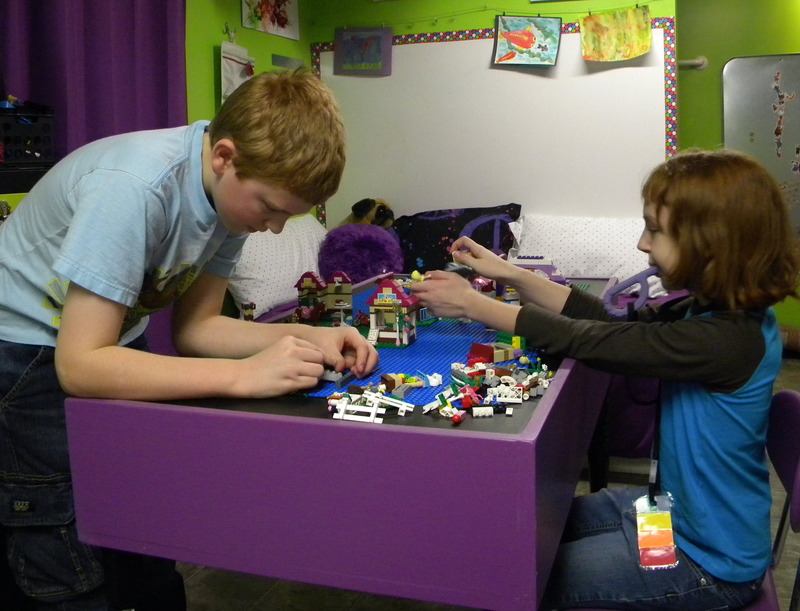 This will give you the correct spacing so that lego structures can be built and secured anywhere on the table. Use Loctite for plastic to adhere the plates and either clamp until dry or place heavy items such as books on top of the plates. *If you have younger children and want to start with Duplos, I recommend attaching the Duplo plates with Command velcro strips. This will hold the plates securely but still allow you to remove them and switch to Legos in the future. 17. Screw in the legs, insert the top and you are finished! The legs are 21″. This makes the table the perfect height to work with our fit balls, chairs, stools or just standing. The purple chair used to look like this. I found it at the thrift store for $2.75 and primed and painted it while I was working on the table. Lumber, screws and wooden legs were $46. I used aspen, you could use pine and cut the cost dramatically. Lego plates were $4.99 each from Amazon, I used 8 for a total of $40. If you use fewer base plates or already have the plates, your cost will be less. I needed to purchase chalk board paint ($13), primer (Zissner 123 $11) and paint (Valspar enamel in Sugar Plum $14). I do have quite a bit of paint leftover for future projects. Again, if you already have the paint you need it will reduce the cost of the project. One afternoon to build the table, 5 days for priming, painting, applying poly and curing/drying. *It was in the 50’s when I started and snowing by the time it was finished! Cold temperatures increase drying time.